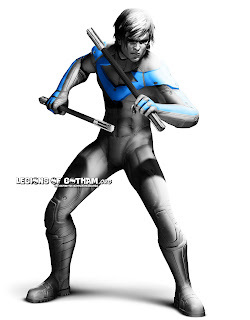 Home » » Nightwing from Batman: Arkham City Revealed! Warner Bros. Interactive Entertainment and DC Entertainment today announced the Nightwing Bundle Pack for Batman: Arkham City will be available November 1. Nightwing comes complete with his own unique gadgets and special moves, and is playable in all challenge maps in the game, as well as two additional challenge maps that are included with the pack: Wayne Manor and Main Hall. The pack also contains a bonus Animated Series Nightwing character skin. The Robin Bundle Pack is scheduled for availability on November 22 to all owners of the game. Both download content bundles will be offered on Xbox LIVE® Marketplace for 560 Microsoft Points and PlayStation®Network for $6.99.